THIS IS A JOHN WICK WEAPON PACK ITEM! The Desertfox, is a high powered Sniper Rifle. Originally designed for desert combat, it wields remarkably well in urban environments. The bullpup design and steady handling makes it a perfect fit on each assassin’s long range gun rack. The Desertfox is a bullpup sniper rifle added with the release of the John Wick Weapon Pack. The Desertfox is a compact bullpup sniper rifle for the particularly sneaky, offering one of the highest Concealment values of its class. Damage-wise, it only falls behind the Thanatos .50 cal in terms of power, being able to effortlessly kill anything short of a Bulldozer in a single headshot unmodified. The tradeoffs are the rifle's very small magazine size of only 5 shots and noticeably third worst base Accuracy stat in the class, though the latter can be remedied with the right mods and skills. This modification was based on the barrel of the full-length Desert Tech SRS-A1. The suppressor part of this modification was based on the DTSS .338 cal Titanium Suppressor for the SRS-A1. While aiming down sights with this gadget, the bullets will land directly on the tiny circle of the sight, not above it. In other words, obscure your target with the small circle to it. While hip firing, the sight lines up relatively close to target, allowing easy hip fire shots at close range. However, sniper rifles overall suffer from an extremely large hipfire cone of fire; aiming down sights is highly recommended. The Angled Sight can be installed along with another sniper scope, and does not replace the default sniper scope if installed without one. The Angled Sight is based on the XTI Angle Mount Sight. Allows you to accurately measure distances up to 200m, displayed on the actual unit and in the reticle. Practical use for this is dubious at best considering that bullets in Payday 2 use hitscan mechanics and have no simulated gravity or windage effects. Furthermore, very few in game locations exist where targets can be engaged from even remotely close to 200 meters away. However, it can be extremely helpful in obtaining the Far, Far Away achievement, as it makes identifying enemies that are at 40m or further much easier. In stealth, the scope will automatically tag any enemy you sweep your sights over, and once the alarm has been sounded, it'll auto-tag specials. This acts similarly to the effects of High Value Target Aced, and having the skill will also cause the increased damage and mark duration. Note: Due to a bug in the current version of the game, this scope is unable to mark enemies in stealth. This is not intended. The Theia Magnified Scope is based on the Leupold Mark 4 LR/T 8.5-25x50mm (30mm) M1 Illum. Ret with a Barrett Optical Ranging System (a.k.a. Ballistic CPU) installed. The Theia Magnified Scope's in-game optic is extremely simplified compared to the real BORS. The system, when paired with a magnification scope, would show indications of humidity, environmental temperature, barometric pressure and projectile elevation/depression for precise compensation, which the in-game scope lacks, though seeing as every sniper rifle in the game uses a hitscan system to determine shot placement, the other miscellaneous functionalities are likely not needed. When aiming down the sight, there is a dim "Y" above the "M" that stands for meters. This dimmed letter would stand for Yards, a different unit of distance measurement. Since the game only uses the metric system, the reason for this being there isn't exactly clear. The Theia Magnified Scope currently has the largest magnification in the game. In Greek mythology, Theia was the Titan goddess of sight and shining light of the clear blue sky. The method of obtaining the sight is ironic to an almost bizarre degree as it's intended for precision shots at long range and not for something that in reality would be haphazard to the point of being insane (i.e. Zip-line Rifling). 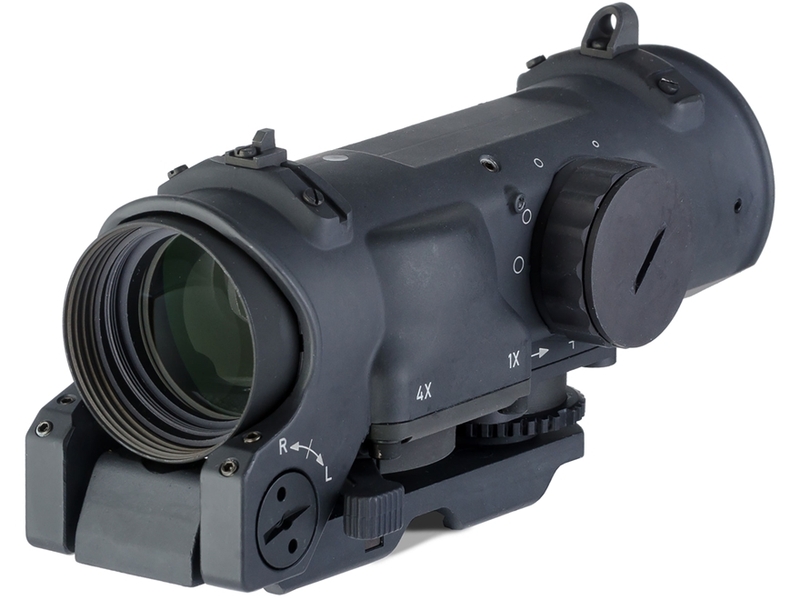 The Box Buddy Sight was based on the Pulsar Digisight LRF N960 N970 Night Vision Scope with proprietary rangefinder. Despite being based upon a dedicated night scope with tinted lens, the Box Buddy Sight provides the same clear sight picture as any other optic in the game when aimed through during daytime or in areas with bright lighting. Everglade refers to a region of tropical wetlands in southern Florida. A Crusader is a participant of one of the Crusades. The Desertfox was based on the Desert Tech SRS-A1 Covert, .338 Lapua Magnum variant as evident by its short forend, 5-round magazine and receiver texture. Modifying it with the Long Barrel turns it into the standard SRS-A1. While the Desertfox's uses what looks to be a 16'' barrel by default, that barrel length is not offered in .338 Lapua Magnum. The standard barrel length for a SRS-A1 Covert is 18'', the in-game one matches that of the .308 Winchester model instead. It should be noted that while the Desertfox was meant to be a reference to the sniper rifle used by John Wick in his eponymous movie, the in-game weapon cannot be modified to resemble it. The most notable differences are the flat dark earth chassis and still much too short railed foregrip even with an upgraded barrel. The Desertfox was manufactured or at least imported into the United States by Crosskill Tactical Armaments as seen on its receiver. Inventory preview of the Desertfox.